The 1985 vintage in Burgundy got off to a late start, thanks to a prolonged winter. The summer, though, was rather warm and sunny all the way through (aside from a pesky hail storm that hit just north of Beaune one day in mid-August). The lack of rain meant growers had healthy fruit to work with, a much needed bit of relief over the previous few vintages. The wines from 1985 were showing well right from the start and many peaked at 5-10 years of age. The 1990 vintage experienced a bit of difficulty during the vines' flowering, taking a longer-than-usual amount of time to complete. The summer was rather warm and sunny, save for a touch of rain in September. Many growers regarded the rain as beneficial; not enough to do damage, but sufficient to revive the thirsty vines. The harvest began around the third week of September in the Cte de Nuits, while it commenced a week earlier in the Cte de Beaune. The vintage is regarded as exceptional and many wines are still viewed as being in a stage of development at 11 years of age. Here's what we found in sampling a broad spectrum of wines, the bottles coming from the cellars of the tasting's participants. Notes Compiled By Gerald Weisl. "There's nobody home." opined the first critic, whose sentiments were echoed by a number of other tasters. "It's drying out, losing its fruit and it thin and simply no longer a very good wine." said a second taster. Another found more interesting elements, detecting "berry fruit, vanilla cream and some brown sugar and licorice notes that make it interesting, but it's not great." One defender of this wine found "ripe, waxy notes with herbs and tar and some sweetness...beautiful, warm lingering finish." Not many people agreed, a final commentator saying this is "tart, shrill and has a bitter olive" character. Ellen's notes included the word "blechh!" if that is a word. She also found orange peel and tomato notes. "Unripened berry, game, wet earth and a tart minerality" were found by one astute taster. Another found the wine to be "rich, but too much acidity and too subdued in terms of fruit." Someone else found "barnyard" notes, while another described this character as "weedy." Someone else found a note reminiscent of ammonia. More positive commentary came from a taster who found "a minty nose, ripe red fruits, fennel and cigar-box tones." Another taster felt it lacked Burgundian character and was not an especially good example of wine made of Pinot Noir, having a "curious smoky scent." Ellen found a meaty note with an onion-like character. Add in my "animal" notes and vegetal character and you've got a main course at dinner! 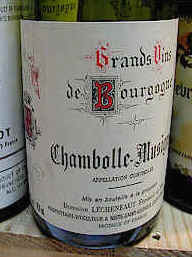 I also found a resinous and root-like quality and felt this was, indeed, Burgundian. There's a fair bit of tannin left in this wine, but its vegetal, rather than fruity tones make it a difficult choice for further aging. "Cherry candy, vanillin, ripe fruit, the herbal aromas and flavors work well together...drink this now." said one critic. Another found this to be "medium-bodied, with sweet black fruits...juicy and a persistent finish." Someone found "black cherry notes, subdued, flat with a wonderful perfume: musk and floral notes...the texture is velvety and feminine." While that sounded good, another taster described it in less glowing terms, noting "it's tired and over the hill." Someone else agreed, finding "maderized, old notes." Ellen imagined "this must have been nice in its day...it's not terrible, but is tired." I wrote that it's an "old, getting-tired Burgundy with sweet fruit and some earthy and herbal elements. 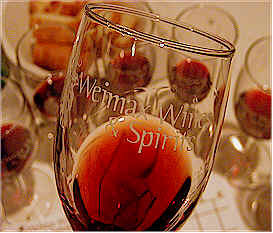 The tannin and alcohol dominate on the palate, as the fruit has given up the ghost." "Unripe plums, violets and a floral note with some toasted wood, but a chalky finish." were the adjectives employed by the first critic. Another taster found the "chalky notes," and only a "little fruit to this out-of-balance wine." Someone else was more positive, finding it "...too young, not mature with bright fruit, nice cherry, floral, spicy notes with a classic Burgundian bit of a barnyard character." "Silky and cherry notes" were found by another person, while another got "silage...black fruits...earthy...tar...herbal, medicine-like notes." Ellen found more onions here. I found a bit of vanillin with some toasty oak and a woodsy character which reminded me of a Charlopin wine of recent vintage. The smoky, hickory, bacony notes come through on the palate. I was quite pleased with this, ranking it highly and finding it to be a one-and-a-half star wine. A few more years of cellaring are not, in my view, out of bounds. One opinionated soul found lots of "fat, strawberry jam notes" and asked that it be "taken away and given to Robert Parker, the famous wine critic." Another taster found "vanillin and smoke, muted berry notes with currants and a diluted, somewhat stalky finish." Someone found "smoky, toasty notes with lemon, citrusy and mint, along with some cigar box notes and firm, silky tannins." Another asserted "This has too much tannin and not enough flavor. The balance is off." Others found "Fresh, bright cherry fruit," adding "this is a lovely wine." Another found it to have "clove, cherry and black plum notes and it's still young." Ellen found some tangy, gritty notes to this lightly oaked Burgundy. 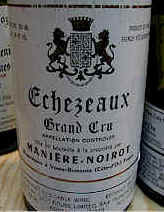 I found it difficult to detect much as it was situated behind the very aromatic and woodsy first place wine. I finally decided it's got some mildly sweet cherry notes and a bit of tannin and vitality, though the astringency seems to be winning this battle over the fruit. One-half star. 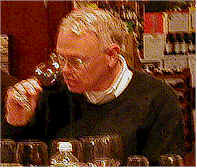 The highest-ranking of the 1985 entries, one taster felt it displayed "delicious, lively fruit, with intense berry notes and a smooth, long finish. Nutmeg and vanilla notes are present, too." Another person found "Black fruits with a mildly barn-yardy quality, with great balance, structure and bright cherry fruit hinting at even greater things to come." Taking issue with that description, one person said it's "a bit faded and tired." Another disagreed, finding "good structure, a lot of life being left here, with plum, cassis and a mocha spice with herbal nuances." Other adjectives included "cedar...red fruit...celery seed...faint cherry...cigar-box." Ellen liked the cherry, vanillin and mocha/coffee notes. "Subdued with wet underbrush and mushrooms" were the descriptors employed by one critic. Another found "forest floor notes with hints of dried porcini...a little bit skunky, rich and full on the palate, with nice texture." Ellen's notes use the "cherry" adjective repeatedly. I found some Asian or Oriental spices with lively berry fruit and a hint of a leathery note. There's still plenty of vitality left, with nice fruit and some tannin. Quite complex. This can go, probably, for another 5-10 years. 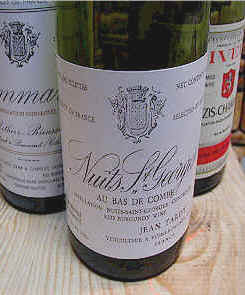 1st Place: JEAN TARDY NUITS-ST.-GEORGES "Au Bas de Combe"
A couple of critics derided this wine saying it "was aged in redwood! ", while the other said it was more "like American oak....quite resinous!" Another taster pegged this as being a "Parker wine; it's got oak all over it!" Others said it shows "Bright cranberry notes with a dusty quality and a lot of oak, roses and some earthy tones...it's drinkable now and head & shoulders above the rest of the field." One gentleman described it as having "nice texture...very feminine." Another person found "ripe, red fruits with some black pepper and violets." Ellen described it as "minty and sweet" with lots of "cherry notes. And it's still alive!" I found plenty of fruit to stand up to the lavish oak treatment. The wine is quite deep and very showy, being quite Burgundian. The palate offers lots of fruit and nice oak, vanillin notes and some creamy, cedar and sandalwood elements. It has enough tannin to go for five to ten years and, importantly, sufficient fruit. Two stars. Cream of this crop!